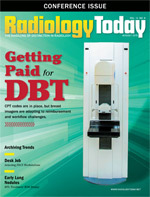 Two interesting articles in this month’s issue look at radiology’s role in cancer detection and treatment. Kathy Hardy writes about reimbursement and workflow issues involved with the expansion of digital breast tomosynthesis (DBT). New CPT codes took effect and Medicare and Medicaid programs now reimburse the procedure, but private insurers are lagging behind, which is hardly new. Patient demand is bolstering DBT in some places, putting breast imagers in what can be an awkward position of telling patients, “We can offer the exam but your insurance won’t cover it and you’ll have to pay out of pocket.” Clinicians are also sorting out how they will incorporate DBT into their workflow if the number of exams really takes off. On the interventional side of radiology, Beth Orenstein writes about a radiofrequency ablation procedure performed at the same time as a biopsy in patients diagnosed with certain early stage lung cancers. Interventional radiologists are investigating the combined procedure to learn whether it might make a difference in patient convenience, cost, or outcomes. The study, led by Abbas Chamsuddin, MD, is a preliminary feasibility study about combining procedures, so the conclusion to be drawn is that the idea merits further investigation. Actually, I wish these stories were merely interesting. As more people I know personally face cancer, such stories pull at me with more gravity than when I was younger. Now that I’ve rolled into my mid-50s, I will know more people with cancer. It’s what happens. But this is not meant to be a lament. These articles make me think about physicians’ efforts to fight disease and save and improve lives. That effort matters so much. Yet, that rewarding nature of medical care too often gets obscured in the discussions of relative value units, meaningful use, turnaround time, HIPAA compliance, reimbursement cuts, regulations, and paperwork. Diagnostic radiologists can be even further removed from that reward when they have little or no contact with patients. From time to time, it’s good to have that piece of the profession reinforced—by yourself and from others.